Many associations related to aquaculture have been formed in the United States over the years. Some have prospered while others have not fared as well. Strong associations, particularly those that represent aquaculture producers, are more important than ever, especially in an era of increasingly burdensome regulations. 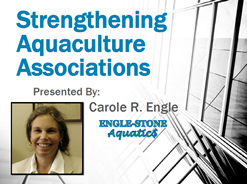 This 1-hour webinar will discuss the value of producer-driven aquaculture associations and provide examples of successes achieved by several associations. New projects underway in the North Central Regional Aquaculture Center to strengthen state aquaculture associations will also be described.